With almost 5 years in Frisco, I’m still in awe of our fabulous Frisco Library. I try to explain this to people… It’s not just rooms of books. It’s a place where people gather with their children for a multitude of activities. A place where people seek solace for quiet reading and where students can research in comfort. For local author, Derek Blount, it’s where he writes almost every day. Derek and I crossed paths as members of the Frisco Library Write Club. Soon after meeting, I was drawn to gain insight into his day-to-day writer’s life. Following two decades in corporate finance with various prominent financial institutions, Derek finally took the plunge to become a full-time writer earlier this year, and the Frisco Library became an obvious choice to spend hours crafting his words on paper. As an ex long-time corporate employee myself, I wondered did he miss that life? A lover of the arts, he has also served on the board of the WaterTower Theatre in Addison for almost 9 years and currently holds the title of Chairman. Besides novels, Derek also writes screenplays and short stories some of which he shares with the members of the Write Club. His short story “Parting the Sea” was featured in the September 2015 issue of MENSA Bulletin: the magazine of American Mensa. Now, his debut novel “Hostile Takeover” has just been launched to rave reviews. 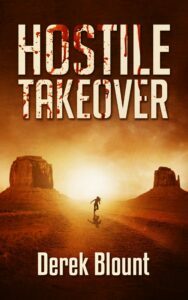 “Hostile Takeover” is the first thriller in a terrifying trilogy set deep in the New Mexico desert. Described as an edge of your seat page-turner, it follows John and Sarah Michaels (recently pulled from the brink of suicide after suffering a tragic loss) as they enter an exclusive rehabilitation where they hope to rediscover a reason to live. John attempts to embrace the program to save his marriage and himself, but as the days pass, he begins to suspect all is not as it seems with the unusual treatment methods. When participants begin dying, John realizes the only chance for his and Sarah’s survival is to do the impossible and launch a hostile takeover of the program. But can he do it before time runs out? Derek said the inspiration for the book came to him while still knee-deep in his corporate career. While he could see it playing out as movie in his head, he just had to put it on paper. Book Two of the Hostile Takeover trilogy, “The Second Son,” is scheduled for release in early 2016. And while the holiday season is upon us, why not consider his first published work “The Three Christmases of William Spencer“ for your family and friends? Available in elegant red linen this hardcover gift book is available now on Amazon and will be treasured by readers of all ages. There’s something magical about a compelling story. Something to which we all respond on a core level. This holiday, use that magic to make your gift-giving memorable. Make the gift matter. Do you really need another basket of assorted nuts and cheeses? Is a bottle of wine memorable? (Especially if you drink the whole thing right away?) However, a compelling story can stick with a reader for a lifetime. This time, it’s personal. Use this opportunity to tell someone why he or she is special to you. We all get presents this time of year, but hearing the giver express why you’re important enough to receive a gift is rare. It only takes a minute to write a note inside the cover of the book you’re giving. A couple sentences will do, and they’ll be reminded of you every time they re-read the story. Derek Blount is a warm and laid- back gentleman with an obvious appreciation of the writing craft. At the Frisco Library Write Club, we’re proud to have him as a member and the entire North Texas area should know about this literary gem. So, consider supporting a local writing star, and purchase one of his works for those on your gift list who just love curling up with a page-turner on a winter’s day. Hi Fern, I have let Derek know & he will be in touch. I would like to get 5 of “The three Christmases of William Spencer” and have Derek autograph them. What do I did to do to accomplish this. Derek I know how proud your parents must be.